Thanks so much to everyone for your time, commitment and all the energy you exerted while working in the Barrett Station Evergreen Cemetery last weekend. Your kind and considerate good deed shall never be forgotten! And, thanks to coordinators Dolly Goodlow and Rev. Rogers Barrett for being so diligent in contacting various individuals in the community, Baytown Lee College volunteers, and those from San Antonio, Texas. We’ve got even bigger plans in the coming months to continue the progress toward further improvements. With supporters like you, the BSEC�s mission will only continue to grow in strength and scope. For accounting and tax purposes, BSEC is an IRS � 501(c)(13) nonprofit organization, so 100% of your donation is tax-deductible as allowed by law. On January 7, 1928, the first cemetery committee for Barrett Station and surrounding areas was organized, with these men present: Mr. Foster Amos, Mr. Henry �Geet� Alfred, Mr. Robert E. Barrett, Reverend P. H. Brown, Mr. Gill Brady, Mr. James Brimer, Mr. Clint Edward, Mr. Sam Goudeau, Mr. Tom Johnson, Mr. Henry Napoleon, Mr. O�Neal Redmond, Mr. David Smith, Mr. George Smith and Mr. Alex Washington. During this first meeting, officers were elected; Mr. Tom Johnson became chairman, Mr. Henry Alfred, Secretary, Mr. Sam Goudeau, Treasurer and Mr. Alex Washington, Trustee. The trustee�s job was to search out the best location for the cemetery and report to the committee in the next meeting. Mr. Will Freeman was asked to work with Mr. Alex Washington. This meeting was adjourned. As time went on, these men became older � some moved and some deceased. However today, tribute is paid to that group in regard to the work done as a group of strong men who stood for unity in organizing the first cemetery committee and purchasing property, and spending time in meetings down through the years. Again, as time went on, fewer and fewer of the first organizers were left; and therefore, some of them were succeeded by members of their families. After the late Mr. Alex Washington, his eldest son, George Washington, became secretary of The Evergreen Cemetery. George served well for several terms, kept records, and consequently, kept the finance records and made bank deposits. In later years after Mr. George Washington�s passing, his younger brother, Alex �Man� Washington, Jr. became secretary-treasurer. After the passing of Mr. Henry Alfred, his son, Hayward Alfred accepted his father�s duties and became trustee, along with Mr. Robert Barrett (who is also deceased). On November 12, 1997, Mr. Hayward Alfred passed away but Mr. Man Washington continues to serve on the committee, today. However, it would be unreal to think that just two men alone could carry a complete community and part of other surrounding areas when there was so much that needed to be done! All the above names mentioned have done what they could, met when they could, and gave what they could while they could. And today, it is up to the descendants of the founding fathers and other faithful volunteers to carry on � pick up the slack and continue a job that was started by our late parents, grandparents, relatives, and friends. It can be done � even though somebody said it could not. But, another strong believer said, �I know something can be done!� She refused to believe that a historically black community of the size of Barrett Station, with loads of intelligence -- better prepared financially -- and better educated today than those 13 men were some 80 years ago cannot carry on the cemetery�s purpose. If they could do it, then, so can we! The organizers purchased property for a cemetery and left it to the community. Eighty odd years ago (back in 1928) these thirteen men got it started and surely we ought to be able to continue. With the help of everyone pulling together, Mrs. Willie Barrett Goodlow, grand daughter of one of the founders � Mr. Foster Amos � said she believed something could be done! Willie is also the daughter of the deceased Robert E. Barrett. Slowly but surely she had to first convince herself whether or not getting involved with a project this large was really a project she wanted to take on. Through prayer she got an answer. The answer was � get involved! Therefore, she began to seek out and found Mr. Alex �Man� Washington, Jr. and Mr. Hayward Alfred willing to accept her help. In the fall of 1982 in a Barrett Station Civic League meeting, she expressed her desire to the president (Mr. Tex Mitchell) to get involved with the present officers of the Civic League to work on the cemetery committee. Mr. Tex Mitchell brought her request to the body of civic members. The civic members were pleased that she wanted to become involved and therefore elected Mrs. Willie B. Goodlow as chairman of the cemetery committee. Mr. Alex Washington, Jr. still serves as treasurer and Mr. Hayward Alfred, as trustee. In this meeting, plans to generate monetary donations for the cemetery�s treasury were discussed by way of sending letters to several neighboring churches, funeral homes and the Civic League. Another plan was to have the first memorial fund-raising service on the last Saturday in May in order to give families a chance to give a financial donation in memory of their loved ones buried in the Barrett Station Evergreen Cemetery. The original name was Evergreen Cemetery, but was subsequently changed to the Barrett Station Evergreen Cemetery because the local bank was confusing the former name with the cemetery in Crosby, Texas, which is also known as the Evergreen Cemetery. 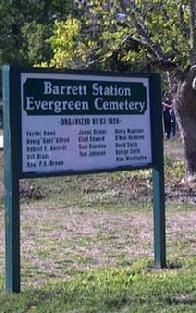 Therefore, Barrett Station�s cemetery was re-named �Barrett Station Evergreen Cemetery�. The committee members and chairman agreed that since the cemetery concerns people in Barrett, Crosby, McNair and other nearby areas, a good plan would be to host the memorial service each year at the most available church, thereby allowing more people to participate in the service and to become involved with the cemetery project. On May 28, 1983, the first memorial service was held at Shiloh Missionary Baptist Church, Rev. G. S. Mathews, pastor. Rev. Mathews delivered his sermon from I Corinthians 11:23. After this service was dismissed, everyone continued on to the cemetery for the military ceremony with the VFW in charge. Afterwards, they gathered back to the church�s cafeteria for eating and fellowshipping. As a tradition, the McGee/Dangerfield families donated a rose bush plant in memory of their deceased � it was to be planted on the church property of Shiloh or in the cemetery at their request. Since the cemetery�s first memorial fundraising service, great accomplishments have been made; individual volunteers such as Mr. Lorenza Goodlow, Mr. Hayward Alfred and the VFW Group have worked diligently and successfully in accomplishing many of our goals. Also, because of their cleaning efforts in the cemetery, along with the first memorial service and donations, the Committee was able to sell plots. In addition, the Committee was blessed to afford a new riding mower for the cemetery! Even though other tools and improvements were still needed to continue the work, it was with great pleasure and gratitude that the cemetery committee and members attributed the cemetery�s collective achievements to individual contributors, the churches and volunteers for their contributions. The committee realizes that the goal they�re still trying so hard to reach can be done only with the help of said contributors � and by the Grace of God. On May 26, 1984, the second memorial service was held at First Missionary Baptist Church, were Rev. E. F. Brown was the pastor. This time, the message was brought by Rev. Rogers Barrett of Los Angeles, California - a native of Barrett Station. His message was delivered from Revelations 20:12. On May 25, 1985, the third memorial service was held at Shiloh Missionary Baptist Church. Rev. Isaac Alfred delivered the message. In 1986, $500 was raised from fundraising activities, which went into the cemetery�s treasure. And -- again -- at Shiloh Baptist Church the message was brought by Rev. Hiawatha Barrett, Sr. Also, another riding mower was purchased, making a total inventory of two riding mowers and one self-propelled mower. The BSEC cemetery volunteers found the month of May was a very busy month and, therefore, not suitable for holding the memorial services. A recent attempt to hold a fund-raising memorial service happened on May 24, 2009. Unfortunately, attendance was low due to conflicting schedules of the residents (with church and local school functions). Nevertheless, funds totaling roughly $400 were collected. In recognition of their volunteer work for the Cemetery, two certificates of appreciation were awarded to the cemetery chairman � Mrs. Willie B. Goodlow, and maintenance caretaker � Mr. Lorenza Goodlow during the program. Even today (i.e., 27 years since the cemetery�s re-organization), these faithful volunteers continue to serve in the same capacity.